My apology for the absence of the usual weekly blog entry last week, but I’ve finally started to write up Willow and the Würzburg Ghosts, reaching chapter three this week, yay! Such moments of unbridled creativity must be exploited to the full and not interrupted by other writing work if possible – hence the absence of my blog entry last week. When writing for children aged 8 to 12 one is usually forced to express emotions or difficult subjects like loss, love, hate, betrayal through metaphors, as abstract concepts are still quite incomprehensible to children of that age. Animals can stand in for their human counterparts, as they are non-threatening, meaning when we see animals behave in a certain way we will react very differently from the way we react towards humans doing quite the same thing. For example, two otters embracing and “kissing” will elicit a heartfelt “awwwww” from us, no matter what age we are, whereas two humans doing the same thing would probably have children reaching for the sick bag. Animals’ characteristics or their behaviour in their own natural habitat can be used to great effect, if employed sensitively. I have already mentioned how animals can serve as a “time” marker in a piece of fiction, with nocturnal animals lending atmosphere to night time scenes or migratory animals serving as reference points of time in a plot…to introduce not just autumn/summer/spring or winter into our story but subjects of birth or death, or the aging process or they can be symbolising youthfulness, the feeling of abandonment or loss. Waterfowl are really good for expressing a number of things, not just for setting the scene of unspoilt nature. For example, herons, egrets and cranes are wonderful for showing patience as well as cunning in a human character. 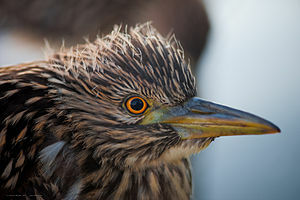 Although we mostly think of waterfowl and sea birds as day time creatures, some of them are nocturnal, among them night herons, the star attraction for today’s blog. Generally speaking, herons are long-legged freshwater and coastal birds that belong to the family Ardeidae; in total there are 64 recognised species, although some are referred to as egrets or bitterns, because they are significantly smaller and have plumage of various colours differing from the typically grey and white herons. We are mainly familiar with grey herons from our day time rambles: they are tall with long legs, have a long beak and their feathers are grey, black and white. Sometimes they will stand for seemingly hours with their wings spread out to shade the water surface, where their beady eyes are trained on small fish or frogs foolish enough to come within pecking distance of a heron’s beak. Herons are also partial to small mammals like voles or other rodents they might espy in fields following harvest time and they’ll not say no to small birds like passing ducklings either. Herons can be found near any type of water way, be it in a pond in a garden, in the reed beds of lakes, along the banks of rivers or in sprawling estuaries. Because of their wingspan, herons circling high up in the air are often mistaken for birds of prey. Grey herons at home in the UK do not migrate and can be seen at any time of the year. Unlike the grey heron the night heron belongs to the genus of Nycticorax, a name that stems from the Greek for “night raven”. They are mainly nocturnal feeders and their croaking call reminds one of angry crows – an eerie sound that can be used to great effect in a bed time story! 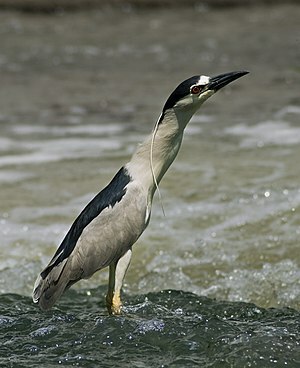 Of the nocturnal herons the Black-crowned Night Heron is perhaps the best known species. Smaller than grey herons but larger than egrets, night herons are often migratory birds when they stem from parts of the world where it can get quite cold during winter. 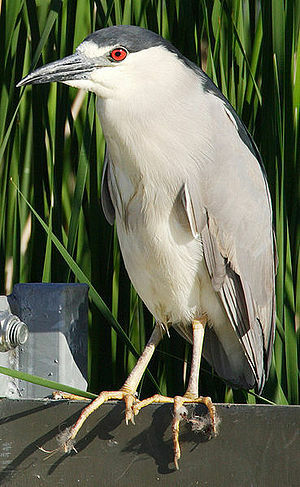 Members of the Black-crowned Night Heron family have quite short legs and a stout appearance with short necks. The two existing species both boast a black crown and a pale belly, while their wings, chest, neck and auricular are typically grey or darker, depending on the species. Their youngsters are brown, with white and grey speckles, and look quite similar to each other in the surviving species. They nest in colonies perched on platforms made from sticks in a cluster of trees, or, where they find sheltered areas like reed beds or islets, they’ll nest on the ground. At breeding time the female lays 3 to 8 eggs. The passage of time expressed by such creatures can either be very long – two people watching the patient hunter, while they are sorting out a major crisis in their lives – or represent a very short interval, such as two people watching a happy duckling swimming along one moment, only for the heron’s beak to find its target with lightning speed, a metaphor for the fact that our life could be over in an instant…and that we should value every moment that we are alive. While very young (8) children won’t get all your subtext and metaphors at first reading, they will eventually, when they return to your writing at a slightly older age. Children’s books for that age group have to work on many different levels, as child readers falling into that age group have a wide range of reading ability. 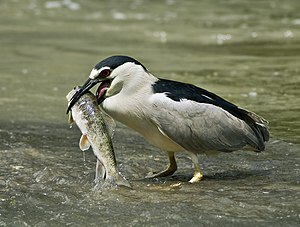 At the 8-year-old stage they might only pick up on your slapstick humour, where your night heron tries to catch a fish, misses and falls over on its beak, but 10 to 12-year-olds will understand that even accomplished predators have bad-hair days…something to be exploited by little ducklings and frogs everywhere. Your heron taking off into the night sky might express the soaring feeling of first love or finally getting mum or dad’s praise. A heron patiently standing for hours on end with its wings shading the surface of the water, before finally catching its fish reminds me of a child that employs patience and cunning to get even with a bully instead of using its fists. Choose your animal representatives wisely and you’ll be able to express quite complex issues without too much difficulty. Wise words indeed. I love it! Thank you very much. I’m trying to expand the range of what I discuss on this blog, since I can’t just go on having allies and brothers-in-arms for Willow’s battle plans.